"I love how-to books! In this edition, Andrea Sittig-Rolf doesn't just explain the concept and power of having ambassadors in your life. She shows you how to go about identifying, connecting with and appreciating them. Follow her strategies and you'll soon find both your personal and business lives improving exponentially." - Tom Hopkins, world-renowned sales trainer and author of "How to Master the Art of Selling"
"I am a firm believer in the concept of Ambassadors - I call them Apostles; Ken Blanchard calls them Raving Fans - as the ultimate customer business partner. Ambassadors are customer advocates spreading the all-important positive word-of-mouth goodwill in the marketplace for you, your products and your business. They are invaluable - priceless! 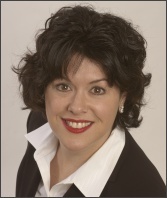 Andrea Sittig-Rolf's new book will unquestionably help you win more Ambassadors which will give you an edge on your competition and substantially increase your sales and profits." "It's all about preparing to win and expecting to win. Power Referrals will provide you with a roadmap to play the game with the intent to win!" 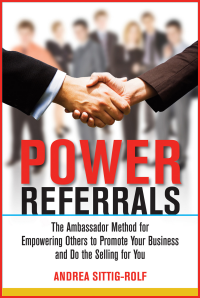 "Don't just read this book...use this book to get Power Referrals to the next VITO in your sales territory!"